You may have seen this little mammal popping up here and there...Well it’s time he was formally introduced! For the past six weeks, An from Straightgrain and I have been scheming and conspiring to bring you…. Let us to tell you more…Secret Squirrel is gearing up for an epic journey, where he will travel to bloggers far and wide, once per month for a year. We know where his journey will start and where his journey will end, but what happens in between is up to those up to take on his sewing challenge. He will deliver emails to willing bloggers to create an outfit for their child based on acorns of inspiration passed on to them by previous bloggers who have met and conquered his missions. So what are acorns of inspiration? Anything you like: a colour, an adjective, a song, a picture or photo, a sewing term, a verb, a food, a pastime, a proverb… let your imagination guide Secret Squirrel on his most important mission. From little things, big things grow. From five acorns of inspiration, comes one giant oak of a creative outcome (in the form of something your child can wear)! 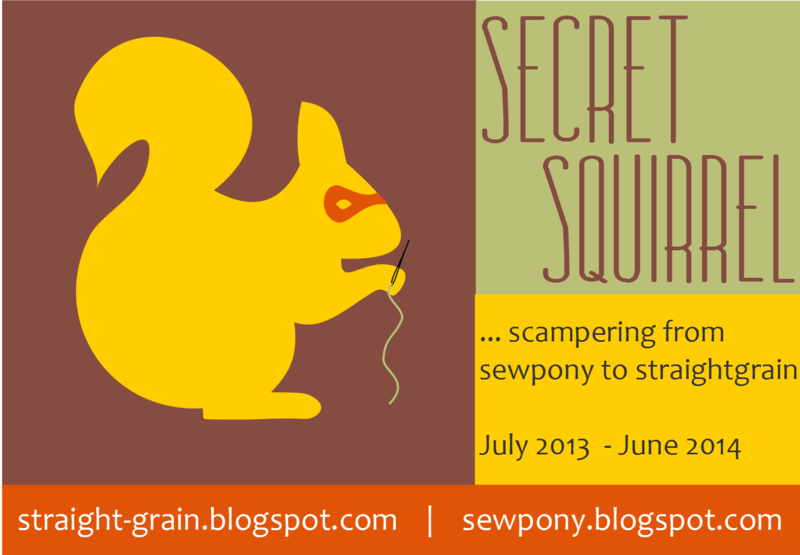 Where will Secret Squirrel go? He will complete his mission in Antwerp, Belgium. The entire year, An and I will keep track of his mission on this special Secret Squirrel page on our blogs, continuously updating the map below and linking to those he visits. Secret Squirrel’s journey is up to you! What we love about Secret Squirrel is that he is his own rodent mammal… We can’t tell him where to go… he will be lead by those he visits and that is what makes this all so very exciting! From Belgium, to Australia, to…Iceland? He will travel many miles and make many new friends. This is his most important mission to date!! So we hope you will welcome Secret Squirrel into your hearts (and your inboxes) and embrace his mission of spreading his inspiration to create fabulous clothing for our little ones. 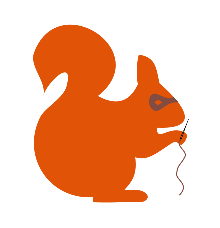 If you would like sew along and help spread the word on Secret Squirrel, feel free to put the button below on your blog and also to add your creation to the Secret Squirrel flickr group. 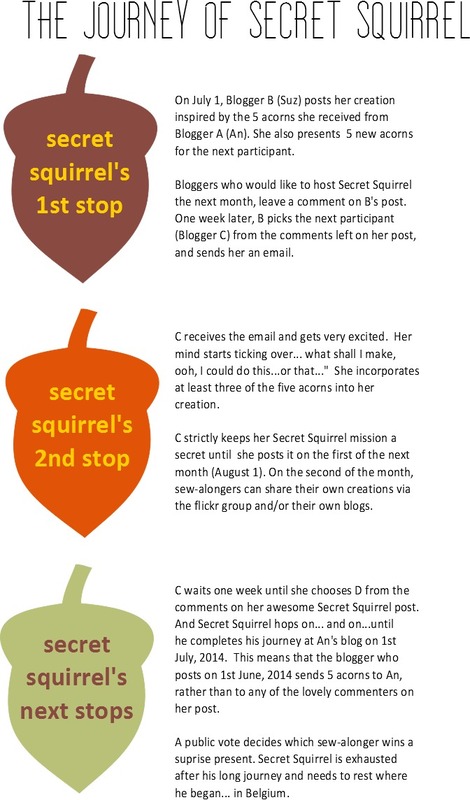 But please, do not blog or add your creation to the group until the second of the month so as not to detract from the blogger who receives the official secret squirrel mission. SewFineFabrics is a fabric store on Etsy which has a great selection of organic cottons (Birch, Monaluna) but also of other prominent brands like Windham (Lotta Jansdotter! ), Michael Miller, Riley Blake, Moda, and the like. Owner Jodi selects only the prettiest prints and best quality cottons, and ships them all over the world at stunning rates! 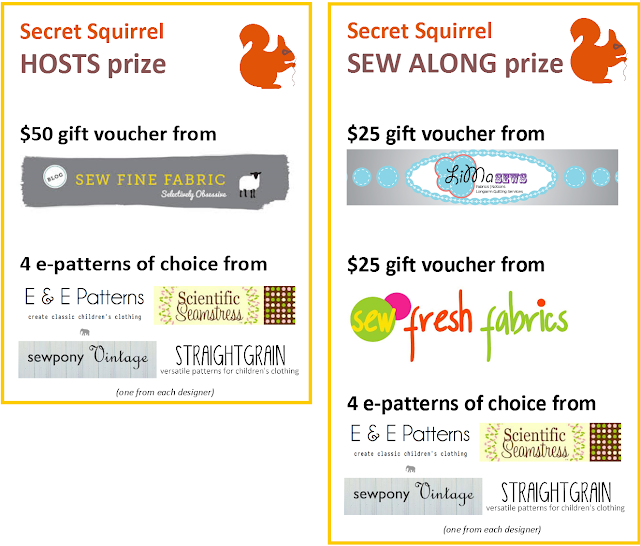 SewFineFabrics is donating a $50 gift voucher to the Secret Squirrel host who sews up the best outfit. Thank you, Jodi! SewFreshFabrics is started as an Etsy shop, but quickly grew into an independent fabric store with an amazing range of fabrics. Designer cottons (Lotta! Amy! Anna Maria! ), organic fabrics (Birch! Cloud 9! ), Japanese import (Kokka! ), solids (Essex linen, Kona cotton!) and more. If you cannot find it in Peg's store, it probably does not exist. The winner of the sew-along competition will be able to go on a $25 shopping spree at SewFreshFabrics. Thank you, Peg! LimaSews is owned by Linh and Mark, and sells some of the top brands and designers in organic and regular quilting fabric. Lotta Jansdotter, Cloud 9, Birch, Art Gallery, Free Spirit, Rowan, ... they're all there! And their prices shipping rates are simply amazing (check out those for shipping outside the US!). The creator of the best sew-along outfit wins $25 worth of delicious fabrics at LimaSews. Thanks, Linh and Mark! Elegance & Elephants probably needs no introduction: designer Heidi's Bubble Shorts pattern was one of the sewing hits of the past few months! But the winner can also select one of her two other patterns (the gorgeous Ruffle Top/Dress, and the super cute Bubble Pocket Top & Spin Skirt), or pick one of her upcoming fall patterns, perhaps? Thanks for giving away two patterns, Heidi! Scientific Seamstress is the alter ego of Carla, a molecular biologist who went from laboratory experiments to sewing experiments. She sells loads of great physical and digital patterns, for children's, women's, men's, and doll's outfits. And a few bags too! Over the past years, Carla has sold thousands of copies of her wonderful designs. Thank you for sponsoring our little squirrel, Carla! Sewpony Vintage is run by Suz (co-organiser of Secret Squirrel) who has just released her first vintage style pattern - Debbie's birthday dress (with blog tour starting next week!). She has another vintage dress pattern in the works and will be adding to her etsy shop over the coming months with more vintage inspired patterns. StraightGrain sells patterns designed by Secret Squirrel co-organizer An, who has a soft spot for simple, clean designs with many different options. After the Bubble dress and Tinny dress patterns, a third pattern (Hanami top and dress) is currently being tested, and a fourth one is in the works. We hope these wonderful prizes will spark your inspiration and enthusiasm for Secret Squirrel... Will you be sewing along? Be sure to add your creations to our Secret Squirrel flickr group!!! Thank you SO much to Carla, Heidi, Jodi, Linh and Marc, and Peg! And good luck to everyone who is participating! Oh this is so exciting!!! What a brilliant idea! So, I can start thinking of soemthing to make using the same 5 tips? Where do you and An get such amazing ideas?! 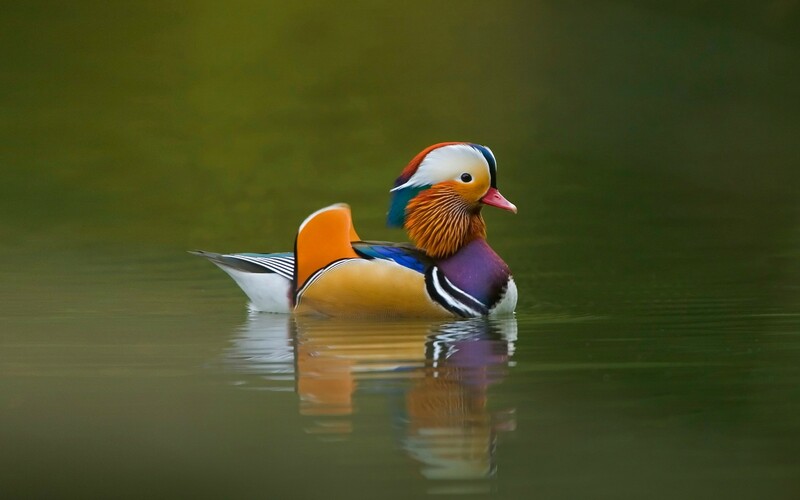 I'm totally amazed! Finally, I was wondering what the squirrel meant! Sounds so fun and I bet will inspire some creative outfits with the 'acorns'. What a great idea! I don't have a blog, but it will be fun to follow along! Brilliant! My head is spinning with excitement... you ladies are genius! WOW! What a genius fun idea! 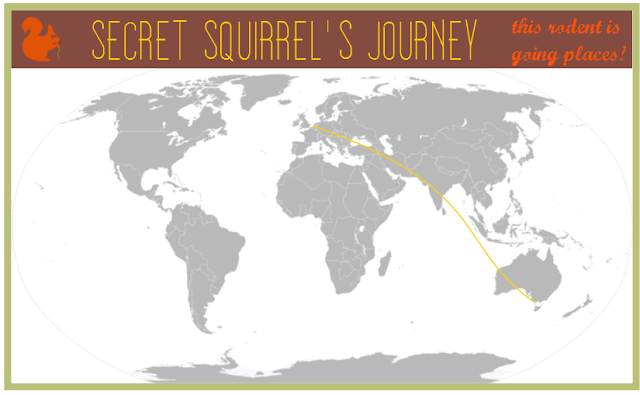 So excited to follow along with this little squirrel as he travels the world. This is too cool! Thanks Heidi! I better get sewing!! This is so FUN! I can't wait to sew along! I have been wondering about that squirrel for ages!! Confession - I kept trying to click on it in your side bar. It sounds so much fun!! You´ll have me spying that little rodent thing for the whole year. Thanks ladies for coming up with such a fresh and exciting idea, it´s awesome! Wow! it sounds fun game, will help you to spread the acorns! (I meant I will grab the button :)). You're brilliant, Suz and An! Um this is a TOTALLY cute idea! I'm just seeing this and it is SUCH a fun idea!! Can't wait to see all the great creations! possessed is "Tre Romances, Op. ISO Certificate issued is based on the findings of the ISO Certification Audit team audit trial and sampling on the dates of audit and upon their satisfaction that on the date of audit the ISO Management System was in compliance with ISO requirements and thus ISO Certification can be granted. You may get a few photos taken and a printed ID card but this is often noted in an old hand written journal that has never been read outside of the shift supervisor.